A new ceramic work completed yesterday based on Durer's Melancholia print. The figure is holding a new New Zealand ten cent piece and the small bowl is intended as a coin holder. I realise I haven't posted a cruz de la semana for quite a while, but here's a studio shot with a new crucifix I picked up last week. 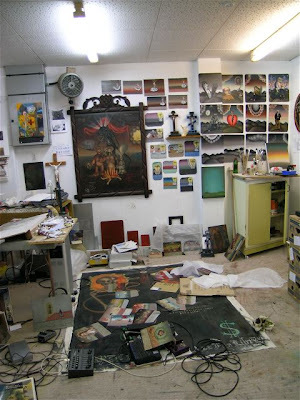 You can see the crucifix to the bottom left of the large framed painting on the wall. The corpus is cast plaster that had sustained damaged around the head, arms and on the right knee. I spent a couple fo hours filling and sanding, then painted it with a tinted undercoat to keep the tone and surface of the original plaster. I've also made a new INRI sign for it as well.